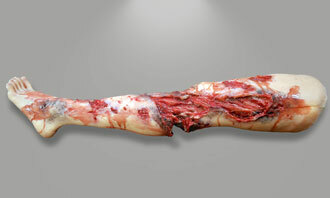 For years, medical training relies mainly on plastic forms, computerized manikins, animals, and cadavers — most of which are not anatomically correct or highly realistic. SIMETRI develops state of the art moulage, through iterative feedback from Subject Matter Experts, in response to this medical training gap. 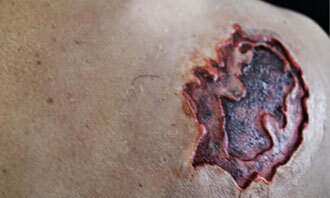 Our moulage includes simulated skin, bone, muscle,fascia and fluids. All of our moulage is intrinsically and extrinsically colored, providing a high degree of durability, even in extreme temperatures. Our moulage is rugged enough to withstand the demands of trauma care scenarios, prolonged stretching and friction, extreme temperature, bandaging and removal, and other stressors. 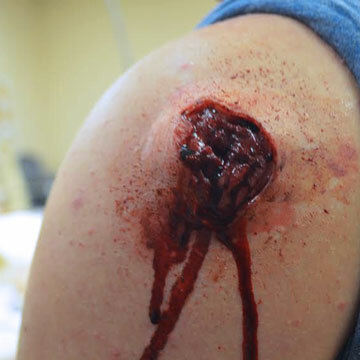 SIMETRI’s moulage offers highly realistic simulated injuries that are affordable and simple to use.